Thank you so much for your generous contribution to the Retina Foundation of the Southwest on North Texas Giving Day. This year, we received 53 donations totaling $14,435! 100% of your donation impacts the 2,300 patients served annually at the Retina Foundation completely free of charge. 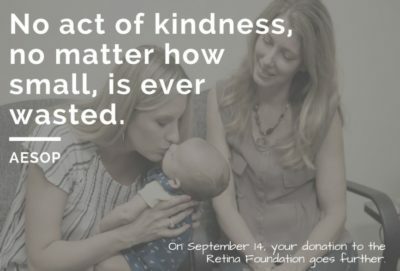 We at the Retina Foundation are honored to be chosen as one of the charities that you choose to support. For without you, we could not conduct research to prevent vision loss and restore sight.